NOW WITH A HEATED DRYER! It’s no secret why millions of people each year are going sunless. It’s the easiest way to give yourself a complete makeover in just minutes. Sunless adds beautiful natural-looking color to your skin without sun exposure. So when you need to look and feel your best, go sunless. Now that you know the Sunless Secret of Mystic Tan, what are you waiting for? 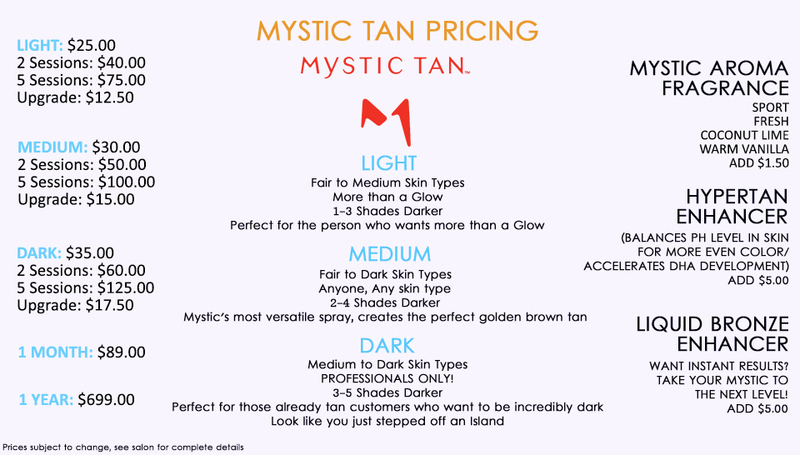 Mystic Tan creates a custom tan and signature look for every style, mood, season and event. That’s what will give you The Color of Confidence. As the leader in sunless tanning for over 15 years, Mystic Tan is the brand you can trust and love. The day of the Sunless spray tanning session refrain from using moisturizers, perfumes, lotions, oils or deodorants that may create a barrier between the skin and the Sunless tanning solution. You may resume using these after your first shower or bath.